Weirdly enough, I've never made this classic bun after so many years of bread baking! 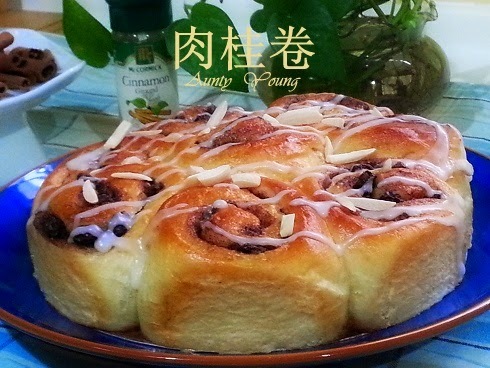 Therefore, in response to the request of NaNak's friend, I decided to bake this bun and add it to my blog. Thanks to NaNak's friend! Even while the bread was resting, it looked nice. The Cinnamon Rolls fresh out of the oven looked even better and more marvelous. 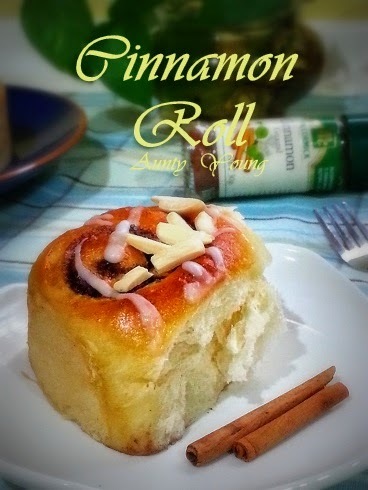 After baking, the Cinnamon Roll turned a beautiful golden brown and sent the aroma of cinnamon wafting around the kitchen. 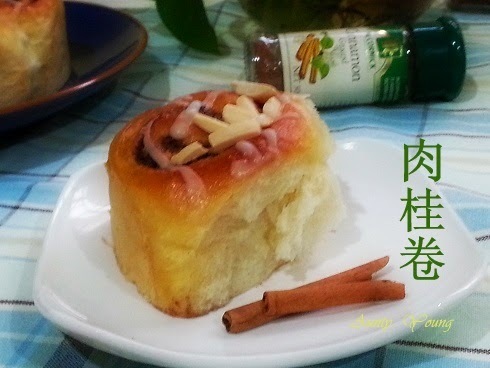 With the sugar glazing and roasted almonds, this bun is an enjoyment to both eyes and mouth. 1. Mix 25g of bread flour evenly in 125g of water. 2. Heat in a pot over low flame. Stir continuously to avoid burning. 3. Remove from heat once the tangzhong has reached a temperature of 65°C (The dough would be thick enough that when stirred, the surface creases). 4. Cover the tangzhong with a cloth or cling wrap. Either use it after it has cooled or refrigerate it to be used on the next day. *Extra tangzhong can be stored in the fridge for a few days. 1. Mix ingredients (A) and (B) using slow speed. 2. Use medium speed when (1) has formed a dough. 3. Add in (C) when after the dough has become elastic. Knead using slow speed, then slowly increase to medium speed. Knead until the dough is soft and pliable. 4. Place the dough into a well-greased bowl and rest for 40 minutes, or until it has doubled in size. Punch down the dough, then shape it into a rectangle. 5. Flatten the bottom edge slightly and sprinkle the dough with water. 6. Spread the mixture of cinnamon powder and caster sugar evenly onto the dough, then scatter raisins on top. 7. Roll the dough downwards, starting from the top edge. 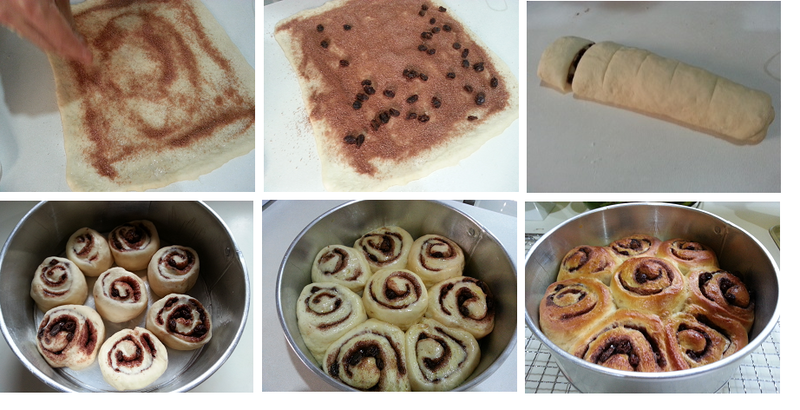 Cut the roll into 8 pieces and place in a greased baking tin. 8. Rest for 40 minutes. Brush with egg before baking in a preheated oven at 180°C for 20 minutes. 9. Mix the sugar glaze evenly and spoon onto the rolls or pipe on in lines. Scatter some roasted almonds onto the rolls and you're done. 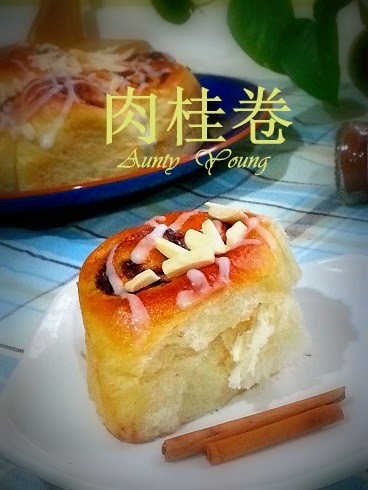 Aunty Young, I love cinnamon rolls! I tried making once before but tak jadi. It was hard. I want to try again using this recipe! 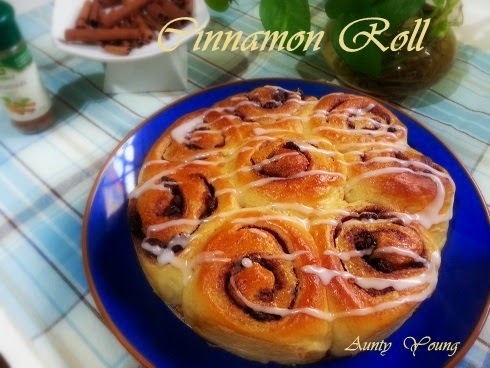 Ooooo I love cinnamon rolls, these look soooo nice!